Worldwide, the most species rich plant communities at small scale (<10 m2 grid) are some types of temperate grassland communities, and of these, the calcareous grasslands of temperate Europe are the most diverse. Calcareous grasslands were once widespread in the hilly calcareous regions of Western Europe but due to changes in agricultural practices (either intensification or abandonment of grazing by sheep and cattle, and the consequent succession towards forest) their extent has decreased dramatically and the remaining areas have become extremely fragmented. In this review we discuss the reported effects of decreasing habitat quality and habitat quantity on plant community composition of calcareous grasslands. Available evidence reveals the strongly negative consequences of both of these processes on plant species, both at the community level as at the population level. It seems, however, that especially the effects of fragmentation on plant species richness on the one side and the effects of management and fragmentation on biotic interactions on the other are still poorly understood and that more research is necessary. 1Calcareous grasslands are known as the most species rich plant communities of northwestern Europe (up to 80 plant species/m2) (WallisDeVries et al., 2002). Because of this extremely high biological diversity, which is also reflected by high arthropod diversity, these areas are integrated in the EU NATURA 2000 network and their communities are included in the appendix of the Habitat Directive (Semi-natural dry grassland and scrubland facies on calcareous substrates (Festuco Brometalia)) (Romao, 1997). 2Historically these grasslands occurred on steep, calcareous outcrops in mountainous regions or on hilly domes, characterized by extreme environmental conditions. Prehistorical human activities such as felling of the primeval forest and later transhumances and increased sheep flock migrations have lead to an increase in area of this habitat (WallisDeVries et al., 2002). At this time many species, often originating from more southern regions, could establish in north-western European calcareous grassland regions, where they were earlier rather confined to natural calcareous open habitats such as forest clearings on calcareous outcrops or on steep slopes where forest development was prevented. 3Intensification of agriculture and abandonment of traditional agricultural practices, often followed by afforestation, resulted in a tremendous decrease in the area and habitat quality of the remaining calcareous grasslands (Keymer, Leach 1990; Poschlod, Schumacher, 1998). As a consequence many often rare calcareous grassland species went extinct or became prone to extinction (WallisDeVries et al., 2002). 7– increasing spatial isolation of the remnant patches (Andren, 1994). 8Since smaller patches generally support smaller populations, a decrease in patch area may lead to increased extinction risk due to decreasing resistance against stochastic extinction events, typically affecting small populations (Shaffer, 1981; Lande, 1988). In small patches that are also spatially isolated, extinction probabilities are expected to further increase through a reduction of colonization events, hampering the ‘rescue’ of the population by the inflow of new individuals (Brown, Kodric-Brown, 1977) or the recolonization of the patches after the species went extinct (Hanski, 1999). 9Simultaneously with the worldwide increasing degree of habitat loss, the consciousness is growing among conservationists that to conserve biodiversity, protecting areas will not be sufficient in the long term and that also ecological restoration is very important. A good understanding of the effects of both fragmentation and management is a prerequisite for successful ecological restoration of more or less severely altered areas (Hobbs, Norton, 1996; Young, 2000). 10In this manuscript we aim at presenting a concise review of the actual knowledge on the effects of habitat fragmentation and management on plant species composition, population persistence and biotic interactions in calcareous grasslands. We discuss these effects both in a conservation and in an ecological restoration context and illustrate them with some preliminary results from a study on the Belgian calcareous grasslands of the Viroin valley. 11Studies monitoring the population persistence of individual species from calcareous grasslands over time are rare (but see Matthies et al., 2004). It is theoretically expected that small population size increases the risk of erosion of genetic variation and of inter-population genetic divergence due to increased random genetic drift, elevated inbreeding, accumulation of deleterious mutations, and reduced gene flow (Young et al., 1996). In the short term, these genetic changes may result in a decline of individual plant fitness, lower reproduction and decreased population viability (Ellstrand, Elam, 1993; Young et al., 1996). 12Empirical evidence for genetic erosion in small populations is supported by the research of van Treuren et al. (1991) on two calcareous grassland species: Scabiosa columbaria and Salvia pratensis. For the latter species, Ouborg and van Treuren (1995) also investigated the relation between genetic erosion and fitness characteristics in relation to population size. It was demonstrated that small populations were in an early genetic erosion process where genetic diversity had already decreased, but where genetic variation underlying fitness traits had not yet been affected. Also for Gentianella germanica, a positive relation between population size and genetic diversity was reported (Fischer, Matthies, 1998a). Moreover, a positive relation between genetic diversity and seed production and germination was demonstrated. 13Other studies focused on the relation between population size and reproductive success, quantified by seed weight, seed number, seed size, germination success and offspring performance. Generally, seed production and offspring performance decreased with decreasing population size. This has been illustrated for the calcareous grassland species Senecio integrifolius (Widén, 1993), Gentianella germanica (Fischer, Matthies, 1998b), Primula veris (Kéry et al., 2000) and Orchis purpurea (Jacquemyn et al., 2002), but not for Salvia pratensis (Ouborg, van Treuren, 1995). 14Although a decrease in seed production may be driven by inbreeding depression, several authors also suggest the importance of pollination limitation, which may differ between populations of different size, whereas small populations are less attractive to pollinators than large populations (Sih, Baltus, 1987; Jennersten, 1988; Agren, 1996). To disentangle genetic effects from effects of pollen-limitation, Fischer and Matthies (1998b) argued that experimental cross- and self-pollinations in populations of different size are needed. This approach has been followed for O. purpurea, where a hand-pollination experiment clearly demonstrated that in small populations fruit production was pollinator limited (Jacquemyn et al., 2002). We further deal with pollination in a next paragraph. 15Although studies dealing with plant population genetics and fitness characteristics revealed already important results for plant conservation, none of them succeeded to integrate them in a long-term, population demographic frame (Oostermeijer et al., 2003). This approach could lead to better insights in how reduced genetic diversity is affecting different plant life stages. 16The ultimate consequence of reduced population viability is local extinction, leading to disappearance of the species from the fragment and consequently to decreased species richness and altered community composition. Often species-area relations are used to describe species richness of fragmented habitats (Figure 1). 17A positive species-area relationship may result from one of the two following ecological hypotheses. First, there is the habitat-heterogeneity hypothesis which predicts higher species numbers because of higher habitat heterogeneity in larger fragments. The second hypothesis, the so called equilibrium hypothesis, considers increasing species numbers with increasing patch area independent of habitat heterogeneity (Rosenzweig, 1995). In the latter case, small habitats contain fewer species than larger habitats because population size in small habitats is restricted and because small populations are more extinction prone. 18Both hypotheses have been tested for 31 calcareous grassland fragments in Germany (Krauss et al., 2004a). These authors found evidence for the habitat heterogeneity hypothesis, but not for the equilibrium hypothesis. It was further shown that this was true for both habitat specialist and generalist species. The authors attributed the lack of a relation between fragment size and extinction probability to the specific plant traits of many calcareous grassland plants. Many calcareous grassland species are long-lived perennials that form remnant populations by prolonged clonal growth (Sammul et al., 2003), possibly exhibiting a lowered susceptibility to habitat fragmentation. The result of this persistence is that current patch occupancy patterns of most clonally propagating species may be not in equilibrium with the present degree of habitat fragmentation (Eriksson, Ehrlén, 2001). This means that the time period since habitat fragmentation (in most studies c. 50 years) may be not sufficient to monitor extinction and that we are dealing with a so called extinction debt (Tilman et al., 1994) in our fragmented grasslands. In this case current patch occupancy is reflecting the historical distribution of habitat fragments rather than the actual distribution. Very recently, Lindborg and Eriksson (2004) found evidence for an extinction debt in Swedish semi-natural grasslands. 19However, in a preliminary analysis of the relation between average plant species richness of 1 m2 plots in a grassland fragment and the area of that fragment we found a positive species-area relation. This may indicate that large fragments contain more species because of lower extinction risks of the populations (Figure 2). The relation remained significant when controlled for the cover of Brachipodium pinnatum. 20The role of specific traits in the persistence of plant species was confirmed by Fischer and Stöcklin (1997) who demonstrated that species with short life cycles, high habitat specificity and short living seeds were more prone to extinction. Also Maurer et al. (2003) showed that species persistence related characteristics, such as onset of flowering, life form, mass per seed and duration of flowering, explained more of the species frequency of occurrence, then other traits such as those affecting dispersal. 21Besides patch area, spatial isolation or the degree of connectivity between patches is another important feature of fragmented habitats. Whereas in literature many threshold values for habitat connectivity can be found for fragmented forests and forest plant species (e.g. Butaye et al., 2001; Honnay et al., 2002), to our knowledge, no information is available with respect to the effects of spatial isolation on the distribution of plant species from calcareous grasslands. We also found no studies that have attempted to integrate individual plant species traits in a landscape ecological context, as has recently been performed for fragmented forest and heathland habitat (e.g. Dupré, Ehrlén, 2002; Piessens et al., 2004). Yet, this approach could elucidate the complex relationship between patch area and connectivity on the one side, and patch occupancy of individual calcareous grassland species on the other. 25– when pollinators avoid small relic populations (Kearns et al., 1998; Kwak et al., 1998). 26Steffan-Dewenter and Tscharntke (1999) showed for Sinapsis arvensis and Raphanus sativus, two annual crucifers, that increasing isolation of experimentally established small calcareous grassland fragments resulted in decreasing numbers of pollinators and lower seed set of the two crucifers. 27Moreover, since species of different trophic levels are differently affected by habitat fragmentation it is likely that also other biotic interactions are altered (Steffan-Dewenter, Tscharntke, 2002). Generally the trophic-level hypothesis of island biogeography states that species of higher trophic levels are more prone to the effects of fragmentation than species of lower levels (Holt et al., 1999). Empirical evidence for this hypothesis was found by Kéry et al. (2001), who showed that reduced reproduction of Gentiana cruciata in small and isolated calcareous grassland fragments was offset by decreased herbivory by its specialised herbivore, Maculinea rebeli. Colling and Matthies (2004) came to similar conclusions and argued that habitat fragmentation may release plants from parasites and pathogens, which may mask the direct negative effects of habitat fragmentation on plant fitness. Krauss et al. (2004b) studied the relation between the occurrence of Cupido minimus and its larval food plant Anthyllis vulneraria. Herbivore population size was positively related to the cover of its host plant, but was independent of patch size and isolation. Unfortunately, the effect of herbivory on the host plant reproduction was not quantified. Groppe et al. (2001), finally, investigated the relation between Bromus erectus and the pathogen, Epichloë bromicola, with respect to small-scale habitat fragmentation. These authors related increased choke disease at the plant level of the host plant and/or the fungus to a higher degree of habitat fragmentation. 28Abandonment of calcareous grassland management has resulted in a sharp decline in suitable habitat area and patch connectivity. Conservation and restoration of the remaining, often strongly degraded calcareous grasslands, is therefore of utmost importance (Kahmen et al., 2002, Mortimer et al., 2002). Since calcareous grasslands in northern and central Europe are a semi-natural vegetation, their long-term conservation requires an appropriate management. 29Abandonment of extensive agricultural management primarily results in a decrease in species richness due to increasing dominance of Brachypodium pinnatum (Willems, 1983; Bobbink, Willems, 1987; 1988; 1991, figure 3), which is attributed to changes in soil nutrient availability (specifically increased availability of nitrogen), increased litter deposition and reduced light availability. However, it is not clear whether increasing dominance of Brachypodium pinnatum is a result of the increased nitrogen levels or whether increased nitrogen levels are a result of increased litter deposition of Brachypodium pinnatum (Bobbink et al., 1988; Hurst, John, 1999). 30Irrespective of the answer to this question, increasing nutrient availability and decreasing light availability may be partially offset by grazing or mowing. Jacquemyn et al. 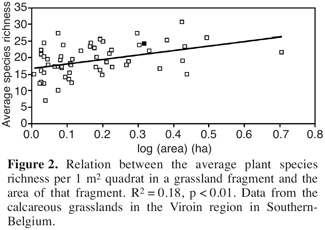 (2003) showed that in the short-term, grazing and mowing of formerly abandoned grasslands resulted in species accumulation curves with higher accumulation rates and saturation points. Moreover, grazing proved to be more efficient than mowing in countering the effects of increased nitrogen levels. Whether grazing or mowing is the most appropriate regular management for high quality calcareous grasslands is less straightforward. In Dutch calcareous grasslands, During and Willems (1984) found that compared to mowing, grazing resulted in a higher species richness and species diversity. Besides the difference between grazing and mowing, also grazing intensity can be extremely variable. Since grazing intensity affects species selectively the high biodiversity of calcareous grasslands can impossibly be conserved by only one type management (Dolek, Geyer, 2002). 31Although most studies recommend grazing as the most appropriate management for calcareous grasslands, Fischer and Wipf (2002) found that in the upper sub-alpine region, calcareous grasslands that have been traditionally mown, were favored by mowing, rather than by grazing. Based on a long term (25 years) experiment Kahmen et al. (2002) found that burning and mulching both were less desirable management regimes for calcareous grassland habitats. When defining appropriate management regimes, history and nature of the community must be considered as very important variables (Grime et al., 2000; Britton et al., 2001). 32Although there may be time-lag of at least 20 years, cessation of management may also result in a decrease in bryophyte diversity. 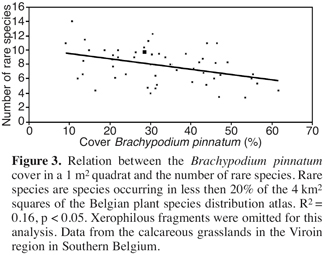 Particularly the number of annual bryophytes which are of high conservation interest decreased due to litter accumulation and the almost complete cover of large pleurocarps (Vanderpoorten et al., 2004). Moreover a high cover of bryophytes also has a negative impact on short-lived forbs in terms of predation, emergence and establishement of seedlings (Keizer et al., 1985; van Tooren, 1988; Zamfir, 2000). 33When calcareous grasslands have been abandoned for some time and succession towards forest has severely altered community composition, the successful restoration of the calcareous grassland will not only depend on an appropriate management strategy, but also on propagule availability and favorable germination conditions (Pärtel et al., 1998). Thereafter, a good management will further enhance the development towards mature, seed producing individuals (Willems, Bik, 1998). 34A potential propagule source for restoration purposes that frequently has been investigated is the soil seed bank (Akinola et al., 1998; Davies, Waite, 1998; Kalamees, Zobel, 1998). Most of these studies agree that typical calcareous grassland species are badly represented in the persistent seed bank, suggesting that seeds of species of open grasslands are unable to persist under developing scrub in the absence of a continuous seed rain (but see Kalamees, Zobel, 1997). Moreover, Davies and Waite (1998) showed that the size of the viable seed bank decreased with distance into the scrub and with the age of the scrub. 35For all these reasons, the significance of the seed bank for restoration of calcareous grassland communities may be rather low. Additional nearby propagule sources are therefore needed to restore species rich calcareous grassland communities, although the importance of natural dispersal mechanisms may not be overestimated. Verkaar et al. (1983) showed that the majority of the seeds in calcareous grasslands were found to reach the ground within 0.5 m of the maternal plant, indicating that seed dispersal of most species is rather low. Poschlod et al. (1998) confirmed this statement and concluded that species’ own dispersal capacities are very low, except for some well wind-dispersed species. 36Besides these mechanisms, several authors have pointed towards the importance of migrating sheep and cattle for plant species dispersal (Fischer et al., 1996; Poschlod et al., 1998). Especially sheep are known as important dispersal vectors for most calcareous grassland species. Based on an extended database of 170 calcareous grassland species and their characteristics, Poschlod et al. (1998) predicted a species richness of respectively 38, 68 and >120 species for sites that have been clear-cut, mown or grazed by sheep. The importance of seed dispersal by sheep was also demonstrated by Fischer et al. (1996) who showed that during one season half of the species number of a calcareous grassland were transported by one sheep and that it was independent from seed or fruit morphology. This indicates that routinely subdividing species by linking dispersal syndromes according to seed or fruit morphological characteristics as has been done by many investigators is a huge oversimplification of the real plant dispersal mechanisms in grazed calcareous grasslands, as was also shown by Higgins et al. (2003). 37After abandonment of extensive agricultural grazing practices, both conservation and restoration of calcareous grasslands seems to be seriously hampered by increasing effects of fragmentation and decreasing habitat quality. Most processes, however, remain poorly understood. 38Although efforts should be increased to increase the extent of calcareous grassland area and to improve habitat connectivity, it must be noticed that the latter is often difficult to realize in most northwestern European landscapes, particularly due to a lack of financial and human means. Moreover, since many calcareous grassland species have a high habitat specificity, do not form a persistent seed bank, and have limited dispersal capacities of their own, the reintroduction of grazing by sheep and the translocation of flocks between spatially isolated calcareous grasslands seems to be a valuable alternative for successful propagule dispersal and long-term conservation of small and often spatially isolated calcareous grasslands. The exchange of flocks from older towards recently restored calcareous grasslands is preferably from a restoration point of view. 39Extensive grazing by sheep is not only important to mitigate the effects of fragmentation, but has also often been mentioned as the most successful management practice for calcareous grasslands. For most regions this is also in accordance with the historical development and the nature of the respective calcareous grassland communities. An important issue in this context is the alternation of grazing intensity and period, within a calcareous grassland. Long-term conservation of the entire calcareous grassland biodiversity can impossibly be maintained by only one management regime, since species, often respond differently towards particular interventions. Moreover, the impact of management is often less well known for a variety of arthropod species and also biotic interactions between species of different trophic levels remain poorly understood. More research is necessary on these topics. 41This manuscript is part of the BIOCORE-research (http://www.agr.kuleuven.ac.be/lbh/lbnl/biocore/) supported by the Federal Services for Scientific and Cultural Affairs (OSTC). The second and the third author have respectively a doctoral and postdoctoral fellowship from the Flemish Fund for Scientific Research (FWO). Thanks to L. Woué , L-M. Delescaille and forester ir. J-P. Scohy for their kind cooperation with BIOCORE. Akinola MO., Thompson K., Buckland SM. (1998). Soil seed bank of an upland calcareous grassland after 6 years of climate and management manipulations. J. Appl. Ecol. 35, p. 544–552. Agren J. (1996). Population size, pollinator limitation, and seed set in the self-incompatible herb Lythrum salicaria. Ecology 77 (6), p. 1779–1790. Andren H. (1994). Effects of habitat fragmentation on birds and mammals in landscapes with different proportions of suitable habitat: a review. Oikos 71, p. 355–366. Barbaro L., Dutoit T., Cozic P. (2001). A six-year experimental restoration of biodiversity by shrub-clearing and grazing in calcareous grasslands of the French Prealps. Biodiversity Conserv. 10, p. 119–135. Bobbink R., Willems JH. (1987). Increasing dominance of Brachypodium pinnatum (L.) Beauv. in chalk grasslands: a threat to a species-rich ecosystem. Biol. Conserv. 40, p. 301–314. Bobbink R., Willems JH. (1988). Effects of management and nutrient availability on vegetation structure of chalk grasslands. In During HJ., Werger MJA., Willems JH. (Eds) Diversity and pattern in plant communities. The Hague: SPB Academic Publishers, p. 123–132. Bobbink R., Bik L., Willems JH. (1988). Effects of nitrogen fertilizer on vegetation structure and dominance of Brachypodium pinnatum (L.) Beauv. in chalk grassland. Acta Bot. Neerl. 37, p. 231–242. Bobbink R., Willems JH. (1991). Impact of different cutting regimes on the performance of B. pinnatum in Dutch chalk grasslands. Biol. Conserv. 56, p. 1–12. Britton AJ., Pakeman RJ., Carey PD., Marss RH. (2001). Impacts of climate, management and nitrogen deposition on the dynamics of lowland heathland. J. Veg. Sci. 12, p. 797–806. Brown JH., Kodric-Brown A. (1977). Turnover rates in insular biogeography: effect on immigration and extinction. Ecology 58, p. 445–449. Butaye J., Jacquemyn H., Hermy M. (2001). Differential colonization causing non-random forest plant community structure in a fragmented agricultural landscape. Ecography 24, p. 369–380. Colling G., Matthies D. (2004). The effects of plant population size on the interactions between the endangered plant Scorzonera humilis, a specialised herbivore, and a phytopathogenic fungus. Oikos 105, p. 71–78. Davies A., Waite S. (1998). The persistence of calcareous grassland species in the soil seed bank under developing and established scrub. Plant Ecol. 136, p. 27–39. Dolek M., Geyer A. (2002). Conserving biodiversity on calcareous grasslands in the Franconian Jura by grazing: a comprehensive approach. Biol. Conserv. 104, p. 351–360. Dupré C., Ehrlén J. (2002). Habitat configuration, species traits and plant distributions. J. Ecol. 90, p. 796–805. During HJ., Willems JH. (1984). Diversity models applied to a chalk grassland. Vegetatio 57, p. 103–114. Ellstrand NC., Elam DR. (1993). Population genetic consequences of small population size: implications for plant conservation. Annu. Rev. Ecol. Syst. 24, p. 217–243. Eriksson O., Ehrlén J. (2001). Landscape fragmentation and the viability of plant populations. In Silvertown J., Antonovics J. (Eds). Integrating ecology and evolution in a spatial context. Oxford: Blackwell Science, p. 157–175. Fischer SF., Poschlod P., Beinlich B. (1996). Experimental studies on the dispersal of plants and animals on sheep in calcareous grasslands. J. Appl. Ecol. 33, p. 1206–1222. Fischer M., Matthies D. (1998a). RAPD variation in relation to population size and plant fitness in the rare Gentianella germanica (Gentianaceae). Am. J. Bot. 85 (6), p. 811–819. Fischer M., Matthies D. (1998b). Effects of population size on performance in the rare plant Gentianella germanica. J. Ecol. 86, p. 195–204. Fischer M., Stocklin J. (1997). 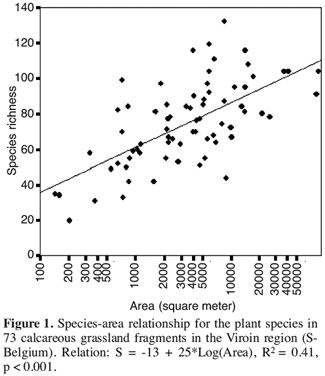 Local extinctions of plant in remnants of extensively used calcareous grasslands in 1950-1985. Conserv. Biol. 11, p. 727–737. Fischer M., Wipf S. (2002). Effect of low-intensity grazing on the species-rich vegetation of traditionally mown sub-alpine meadows. Biol. Conserv. 104, p. 1–11. Goverde M., Schweizer K., Baur B., Erhardt A. (2002). Small-scale habitat fragmentation effects on pollinator behaviour: experimental evidence from the bumblebee Bombus veteranus on calcareous grassland. Biol. Conserv. 104, p. 293–299. Grime JP., Brown VK., Thompson K., Masters GJ., Hillier SH., Clarke IP., Askew AP., Corker D., Kielty JP. (2000). The response of two contrasting limestone grasslands to simulated climate change. Science 289, p. 762–765. Groppe K., Steinger T., Schmid B., Bauer B., Boller T. (2001). Effects of habitat fragmentation on choke disease (Epichloë bromicola) in the grass Bromus erectus. J. Ecol. 89, p. 247–255. Hanski I. (1999). Metapopulation ecology. Oxford, UK: Oxford University Press. Higgins SI., Nathan R., Cain ML. (2003). Are long-distance dispersal events in plants usually caused by nonstandard means of dispersal? Ecology 84 (8), p. 1945–1956. Hobbs RJ., Norton DA. (1996). Towards a conceptual framework for restoration ecology. Restor. Ecol. 7, p. 93–110. Holt RD., Lawton JH., Polis GA., Martinez ND. (1999). Trophic rank and the species-area relationship. Ecology 80, p. 1495–1504. Honnay O., Verheyen K., Butaye J., Jacquemyn H., Bossuyt B., Hermy M. (2002). Possible effects of climate change and habitat fragmentation on the range of forest plant species. Ecol. Lett. 5, p. 525–530. Hurst A., John E. (1999). The biotic and abiotic changes associated with Brachypodium pinnatum dominance in chalk grassland in South-east England. Biol. Conserv. 88, p. 75–84. Jacquemyn H., Brys R., Hermy M. (2002). Flower and fruit production in small populations of Orchis purpurea and implications for management. In Kindlmann P., Willems JH., Whigham DF. (Eds) Trends and fluctuations and underlying mechanisms in terrestrial orchis populations. Leiden, The Netherlands: Backhuys Publishers, p. 67–84. Jacquemyn H., Brys R., Hermy M. (2003). Short-term effects of different management regimes on the response of calcareous grassland vegetation to increased nitrogen. Biol. Conserv. 111, p. 137–147. Jennersten O. (1988). Pollination in Dianthus deltoides (Caryophyllaceae): effects of habitat fragmentation on visitation and seed set. Conserv. Biol. 2, p. 359–366. Kahmen S., Poschlod P., Schreiber KF. (2002). Conservation management of calcareous grasslands. Changes in plant species composition and response of functional traits during 25 years. Biol. Conserv. 104, p. 319–328. Kalamees R., Zobel M. (1997). The seed bank in an Estonian calcareous grassland: comparison of different successional stages. Folia Geobot. Phytotax. 32 (1), p. 1–14. Kalamees R., Zobel M. (1998). Soil seed bank composition in different successional stages of a species rich wooded meadow in Laelatu, Western Estonia. Acta Oecol. 19, p. 175–180. Kearns CA., Inouye DW., Waser NM. (1998). Endangered mutualisms: the conservation of plant pollinator interactions. Annu. Rev. Ecol. Syst. 29, p. 83–112. Keizer PJ., van Tooren BF., During HJ. (1985). Effects of bryophytes on seedling emergence and establishment of short-lived forbs in chalk grassland. J. Ecol. 73, p. 493–504. Krauss J., Klein AM., Steffan-Dewenter I., Tscharntke T. (2004a). Effects of habitat area, isolation, and landscape diversity on plant species richness of calcareous grasslands. Biodivers. Conserv. 13, p. 1427–1439. Krauss J., Steffan-Dewenter I., Tscharntke T. (2004b). Landscape occupancy and local population size depends on host plant distribution in the butterfly Cupido minimus. Biol. Conserv. 120, p. 359–365. Kéry M., Matthies D., Fischer M. (2001). The effect of plant population size on the interactions between the rare plant Gentiana cruciata and its specialized herbivore Maculinea rebeli. J. Ecol. 89, p. 418–427. Keymer K., Leach SJ. (1990). Calcareous grasslands – a limited resource in Britain. In Hillier SH., Walton DHW., Wells DA. (Eds) Calcareous grasslands: ecology and management. Huntington: Bluntisham Books, p. 11–20. Kwak MM., Velterop O., van Andel J. (1998). Pollen and gene flow in fragmented habitats. Appl. Veg. Sci. 1, p. 37–54. Lande R. (1988). Genetics and demography in biological conservation. Science 241, p. 1455–1460. Lindborg R., Eriksson O. (2004). Historical landscape connectivity affects present plant species diversity. Ecology 85, p. 1840–1845. Matthies D. , Brauer I., Maibom W., Tscharntke T. (2004). Population size and the risk of local extinction: empirical evidence from rare plants. Oikos 105, p. 481–488. Maurer K., Durka W., Stöcklin J. (2003). Frequency of plant species in remnants of calcareous grassland and their dispersal and persistence characteristics. Basic Appl. Ecol. 4, p. 307–316. Menges ES. (1991). The application of minimum viable population theory to plants. In Falk DA., Holsinger KE. (Eds) Genetics and conservation of rare plants. Oxford: Oxford Univ. Press, p. 47–61. Mortimer SR., Booth RG., Harris SJ., Brown VK. (2002). The effects of initial site management on the Coleoptera assemblages colonising newly established chalk grassland on ex-arable land. Biol. Conserv. 104 (3), p. 301–313. Oostermeijer JGB., Luijten SH., den Nijs JCM. (2003). Integrating demographic and genetic approaches in plant conservation. Biol. Conserv. 113 (3), p. 389–398. Ouborg JN., van Treuren R. (1995). Variation in fitness-related characters among small and large populations of Salvia pratensis. J. Ecol. 83, p. 369–380. Piessens K., Honnay O., Nackaerts K., Hermy M. (2004). Plant species richness and composition of heathland relics in north-western Belgium: evidence for a rescue-effect? J. Biogeogr. 31 (10), p. 1683–1692. Poschlod P., Kiefer S., Tränke U., Fischer S., Bonn S. (1998). Plant species richness in calcareous grasslands as affected by dispersability in space and time. Appl. Veg. Sci. 1, p. 75–90. Poschlod P., Schumacher W. (1998). Rückgang von Pflanzen und Pflanzengesellschaften des Grünlandes-Gefährdungsursachen und Handlungsbedarf. Schriftreihe Vegetationskunde 29, p. 83–99. Pärtel M., Kalamees R., Zobel M., Rosén E. (1998). Restoration of species-rich limestone grassland communities from overgrown land: the importance of propagule availability. Ecol. Eng. 10, p. 275–286. Romao C. (1996) Interpretation manual of European Union habitats. Vs. EUR 15. European Commission DG XI. Environment, Nuclear Security & Civil protection. Rosenzweig ML. (1995). Species diversity in space and time. Cambridge: Cambridge University Press. Sammul M., Lull K., Tamm A. (2003). Clonal growth in a species-rich grassland: results of a 20-year fertilization experiment. Folia Geobot. 38, p. 1–20. Shaffer ML. (1981). Minimum population sizes for species conservation. BioScience 31, p. 131–134. Sih A., Baltus MS. (1987). Patch size, pollinator behavior and pollinator limitation in catnip. Ecology 68, p. 1679–1690. Steffan-Dewenter I., Tscharntke T. (1999). Effects of habitat isolation on pollinator communities and seed set. Oecologia 121, p. 432–440. Steffan-Dewenter I., Tscharntke T. (2002). Insect communities and biotic interactions on fragmented calcareous grasslands: a mini review. Biol. Conserv. 104, p. 275–284. Stocklin J., Fischer M. (1999). Plants with longer-lived seeds have lower extinction rates in grassland remnants 1950-1985. Oecologia 120, p. 539–543. Tilman D., May RM., Lehman CL., Nowak MA. (1994). Habitat destruction and the extinction debt. Nature 371, p. 65–66. Vanderpoorten A., Delescaille LM., Jacquemart AL. (2004). The bryophyte layer in a calcareous grassland after a decade of contrasting mowing regimes. Biol. Conserv. 117 (1), p. 11–18. van Tooren BF. (1988). The fate of seeds after dispersal in chalk grasslands: the role of the bryophyte layer. Oikos 53, p. 41–48. van Treuren R., Bijlsma R., Van Delden W., Ouborg NJ. (1991). The significance of genetic erosion in the process of extinction. Genetic differentiation in Salvia pratensis and Scabiosa columbaria in relation to population size. Heredity 66, p. 181–189. Verkaar HJ., Schenkeveld AJ., van de Klashorst MP. (1983). The ecology of short lived forbs in chalk grasslands: dispersal of seeds. New Phytol. 95, p. 335–344. WallisDeVries MF., Poschlod P., Willems JH. (2002). Challenges for the conservation of calcareous grasslands in Northwestern Europe: integrating the requirements of flora and fauna. Biol. Conserv. 104, p. 265–273. Widén B. (1993). Demographic and genetic effects on the reproduction as related to population size in a rare, perennial herb, Senecio integrifolius (Asteraceae). Biol. J. Lin. Soc. 50, p. 179–195. Wilcock CC., Neiland R. (2002). Pollination failure in plants: why it happens and when it matters. Trends Plant Sci. 7, p. 270–277. Willems JH. (1983). Species composition and above-ground phytomass in chalk grassland with different management. Vegetatio 52, p. 171–180. Willems JH., Bik LPM. (1998). Restoration of high species density in calcareous grassland: the role of seed, rain, and soil seed bank. Appl. Veget. Sci. 1, p. 91–100. Young A., Boyle T., Brown T. (1996). The population genetic consequences of habitat fragmentation for plants. Trends Ecol. Evol. 11, p. 413–418. Young TP. (2000). Restoration ecology and conservation biology. Biol. Conserv. 92, p. 73–83. Zamfir M. (2000). Effects of bryophytes and lichens on seedling emergence of alvar plants: evidence from greenhouse experiments. Oikos 88 (3), p. 603–611. Jan Butaye, Dries Adriaens & Olivier Honnay, «Conservation and restoration of calcareous grasslands: a concise review of the effects of fragmentation and management on plant species», BASE [En ligne], volume 9 (2005), numéro 2, 111-118 URL : https://popups.uliege.be:443/1780-4507/index.php?id=1516. Laboratory for Forest, Nature and Landscape Research. University of Leuven. Vital Decosterstraat 102. B–3000 Leuven (Belgium).